“How did it go?” I can’t tell you how many times I’ve been asked that question the past few days! … and that’s the real issue. What was I hoping for? Well, you know how I feel about funding lung cancer research. Lung cancer causes 27% of cancer deaths in Canada but research only gets 7 cents for each cancer dollar. That’s not fair! I hope for lung cancer research to be fair! Last week, though, we weren’t asking for research dollars. I think my cards were an effective way to get across the main point from my story – that lung cancer research makes a real difference for families like ours (and is worth funding) – very powerfully and quickly. Access to innovative new treatments has extended my life! Everyone I gave my card to looked at it, and I think the message hit home. I listened as MPPs shared personal stories of losing loved ones to lung cancer. Some of the people in the room were clearly already committed to the cause. Others seemed very interested and open to further conversations and deeper commitments. I was grateful for everyone’s presence there and spoke with as many as I was able. Many good conversations were happening around the room! One speaker noted that lung cancer kills over 20,000 Canadians every year, the size of a small city every year! Our three main messages for the day were: screening programs (save lives, time and money), lung cancer patients deserve timely and affordable access to innovative treatments, and patient voices must be heard! After breakfast, several of us observed Question Period in the Legislature. What an interesting experience! (My first time.) For those who may not know, our provincial government has recently introduced a new plan for families with an autistic child or children. They claim it will help more families, but it works out to less funding per family. Families have been protesting, and that day quite a large number were in the gallery. One after another, members of the opposition introduced families and described their situation and how the funding changes would negatively affect them. It was very sad, very hard to listen to, but it reinforced to me the importance of telling our stories. Clearly the Opposition together had determined this was the best strategy to sway the Government, and I can tell you that it was powerful. After Question Period, quite a few meetings were scheduled with MPPs. 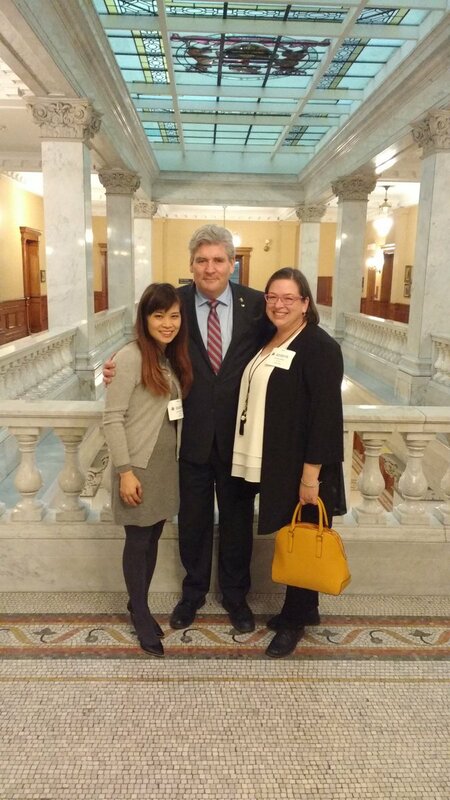 I wasn’t very nervous about meeting with MPP John Fraser, because I had sat beside him at the pre-election town hall meeting at which I spoke last Spring, and he was very encouraging. This time he expressed interest in our messages and appreciation that I had traveled all the way to meet him there in his Toronto office rather than in Ottawa. He honoured me by listening intently and saying how important my story is. My fellow advocates had many similar experiences in their meetings. So, how did it go? To be honest, I’m not sure. I plan to ask the organizers what they think, once they’ve had time to process it. They’re the experts. I’m just a voice of lung cancer, telling my story, representing countless others, and trying to do that well. I hope that it makes a difference – even the smallest difference. That’s what I hope for. Even though I set two alarms to make sure I woke up in time, I managed to sleep through both of them, plus the two that regularly go off on a Tuesday morning. I can’t believe I slept through four alarms this morning!!! I’ve never done that in my life! I guess I needed that extra hour and a half of sleep, and somehow -miraculously- I wasn’t terribly late for my ride and we made it to the station in plenty of time. So thankful! This Family Day long week-end has felt like a whirlwind, with all three kids flinging off in varying directions at various times. Good directions, great discussions! So glad to have them home and tucked into bed. I love our conversations around the table, and also the one-on-one times. I’m blessed! Oldest is asking profound questions. Also cooked burritos for dinner. From scratch: tortillas and all. Amazing! Middle was at Ontario Youth Parliament and is energized, ebullient, keen for next year. Joy! Youngest (among many other things) made and photographed this gorgeous cake (from scratch) for one of her friends. I’m filled with gratitude and awe as I watch them growing up! … and I’m feeling kind of nervous about my little whirlwind of a trip to Toronto in the morning. I feel privileged to go. I’m healthy enough. I’m going with great people. It’s well-organized. We bring important messages… and -importantly- people have said they’re coming to hear us. Thank you to everyone who contacted their MPP! It means a lot to have you standing with us. We need a team surrounding us as we speak for so many people affected by lung cancer who can’t make it to Queen’s Park this week. Thank you to all the MPP’s who are coming to the breakfast and taking meetings with us. I’m grateful for this opportunity. And a heartfelt thank you to Canadian Cancer Survivors Network and Lung Cancer Canada, and everyone involved in the #Right2Survive campaign. I am honoured to travel to Toronto next week to represent Ontario lung cancer patients as I tell my story to MPP’s at Queen’s Park. If you live in Ontario, it would mean a lot if you would take a few moments to call or email your MPP’s office to ask if she or he will be attending the Lung Cancer Patients – Right2Survive Legislative Reception breakfast on Wednesday February 20 at Queen’s Park (presented by Canadian Cancer Survivor Network, in partnership with Lung Cancer Canada). It’s not hard to do! Every time I’ve contacted a politician’s office, a very kind person has been very helpful. It only takes a moment or two. While you’ve got their attention, please also mention that lung cancer is Ontario’s number one cancer killer (Number 1 in the world), but outcomes lag behind all other major cancers. But more than just hearing statistics, people of influence need to meet real people and hear real stories. Please tell your MPP about me. I’m representing Ontarians affected by lung cancer. Please tell your MPP that I’ll be there and I’d love to meet them. We were shocked by my lung cancer diagnosis when our kids were only 6, 10 and 12, because we thought all my healthy choices would protect me from getting it. We are incredibly grateful for the five years which brand new lung cancer treatments have extended my life, starting with an investigational drug in a clinical trial. I can’t tell you how much it means that I’m alive to see my oldest accepted into Electrical Engineering at both Carleton and University of Ottawa. I hope I’ll live long enough for more milestones and memories. I’ve got more meetings with influential people on the calendar, so I decided to have new cards made. I paid extra to have our picture on them because I want to emphasize that we are real people, not just numbers. This picture of my family, prior to my diagnosis will help tell our story and communicate the value of lung cancer research to people of influence. My kids don’t just have pictures of their mom. My kids have a Mom who is alive, who loves them and makes a difference in their lives! I have been here to hug them at night and help them navigate life during these significant years, and I am grateful! A mom’s yearning is to be there for her kids. As lung cancer research improves, more of us will be here for our family and friends. We’ll live longer and healthier. We don’t look the same now: we’ve changed these five years. New lung cancer research (and the grace of God!) has allowed me to continue to be in the picture. I get to see my oldest get accepted into Electrical Engineering programs everywhere he applied! I get to see my middle child play more musical instruments, and play them better and better as he keeps practicing and practicing! I get to see my youngest be the oldest kid in her school, and face some of the challenges 12yo’s encounter. I am so thankful … and I hope I’ll get to be there for many many more milestones and memories! I’m going to Queen’s Park next week to represent lung cancer patients by telling my story! What a difference this gift of five years has made for our family! Lung Cancer patients need more money for more research for better outcomes for more survivors and better survivorship! Will you stand with me, with us? Here are a couple of links to help you get started! To find contact info for your MPP, click here for a current list of all MPP’s. If you’re not sure who your MPP is, click here to find your Electoral District, by entering your postal code or lot and concession address, and you’ll find a link to info about your MPP. I really hope I’ll get to meet your MPP! Please also Tweet it out (I’m @JillHW), or post it on fb or Instagram (I’m not there lately but working on resolving the problem.) Thank you! Thank you to Canadian Cancer Survivors Network for organizing the event in partnership with Lung Cancer Canada.